The New Year’s Biggest Debuts – SHADOWMAN and HARBINGER WARS 2 – March Onward with Creators Allén & Martín, Diggle, Giorello, Heisserer, Kindt, Segovia & Surprises Galore! Valiant is proud to announce that it is joining Free Comic Book Day 2018 with the VALIANT FCBD 2018 SHADOWMAN SPECIAL – a world-shaking, silver-level offering featuring a closer look at the renowned publisher’s biggest and most impactful releases of the New Year with advance looks ahead at SHADOWMAN, HARBINGER WARS 2, and surprise guests galore! On May 5th, 2018, Free Comic Book Day begins in full force as superstar writer Andy Diggle (Green Arrow: Year One, Daredevil) and high-octane artist Stephen Segovia (NINJAK, Action Comics) take the helm of the VALIANT FCBD 2018 SHADOWMAN SPECIAL to present a must-read introduction to Shadowman as Jack Boniface reemerges from the Deadside to reclaim his birthright…and forge a new legend of magic, might, and malice for the long-awaited return of Valiant’s most-demanded hero! Then: Jump on board the seismic comics event of 2018, HARBINGER WARS 2, here as New York Times best-selling writer Matt Kindt (DIVINITY), Academy Award-nominated writer Eric Heisserer (Arrival), and blockbuster artists Tomás Giorello (X-O MANOWAR), Raúl Allén (SECRET WEAPONS) and Patricia Martín(BLOODSHOT REBORN) plunge X-O Manowar, Bloodshot, the Harbinger Renegades, Livewire, and the whole of the Valiant Universe into an epic power struggle with the potential to tear America apart, just days after HARBINGER WARS 2 #1 (of 4) hits stands! Plus: Also, coming to the VALIANT FCBD 2018 SHADOWMAN SPECIAL – X-O MANOWAR, BLOODSHOT SALVATION, NINJA-K, QUANTUM AND WOODY, SECRET WEAPONS, and top-secret surprise appearances from across the Valiant Universe! Be here as Valiant begins its biggest year yet with a bountiful barrage of stories, sneak peaks, teasers, and more, exclusively for Free Comic Book Day 2018! 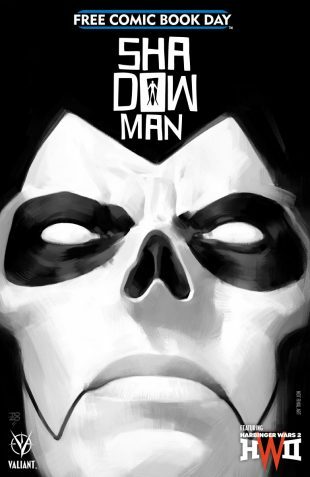 But first: On March 28th, get an advance jump on the action as Shadowman storms to the forefront of the Valiant Universe – more powerful, more terrifying, and more relentless than ever before – in the all-new SHADOWMAN #1 from master storytellers Andy Diggle and Stephen Segovia! 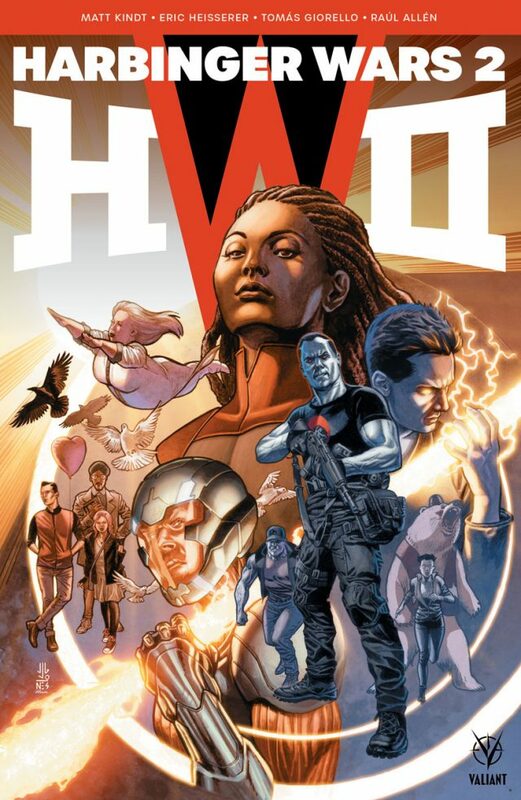 And then, on May 2nd – right before Free Comic Book Day 2018 – the Valiant Universe will never be the same when HARBINGER WARS 2 #1 (of 4) erupts in full force, as all-star writers Matt Kindt and Eric Heisserer and incendiary artists Tomás Giorello, Raúl Allén, and Patricia Martín launch the opening salvo of the summer’s most devastating comics event!